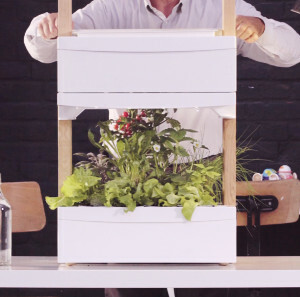 One Fresh Square grows 12 plants simultaneously, providing you a significant amount of fresh herbs and small veggies. If you stack 4 Fresh Squares on top of each other, it’s enough for you to not have to buy those fresh greens anymore. 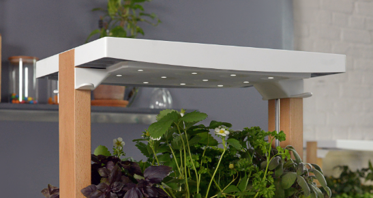 The automatic plant light will turn on every morning and off every evening. Insert the 12 organic refills of your choice. By setting your lamp close from your plants you stimulate their growth. Fill the water tank every 3 weeks. Combine or stack Fresh Squares together to grow more food. Most Fresh herbs and other leafy plants (like salads or spinach) are fully grown after 4 to 6 weeks. 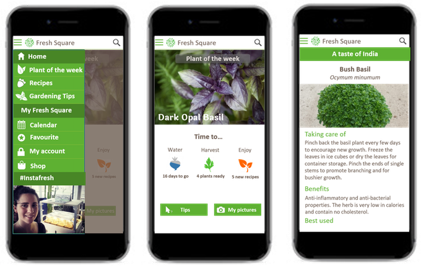 You can follow the growth of your plants with our app. Go to All you can grow to discover our catalogue. Solidity, lightness, fashion, waterproof and yet ecodesigned… Meet Fresh Square. Fresh Square is made or recycled aluminium and metal, as well as wood from environmentally friendly managed forests and recycable plastic. Everything was designed so we can easily replace each part. 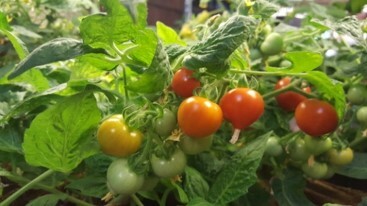 Your plants will not “just grow”, they will be healthy and strong to bring you freshness and taste. We developed a specific soil in collaboration with the University of Liege – Gembloux Agrobiotech. 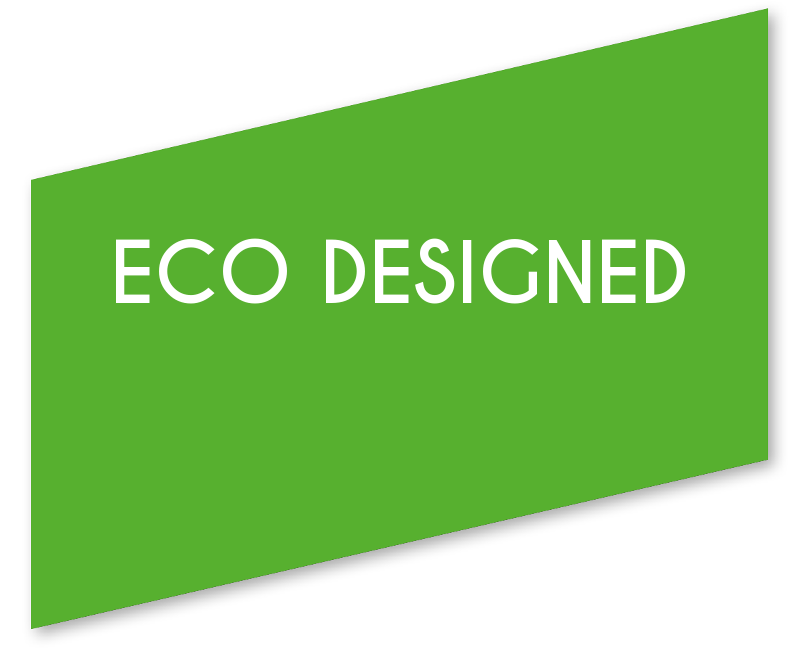 Our soil is made only of natural ingredients and organic wastes with 0 industrial fertilizers. 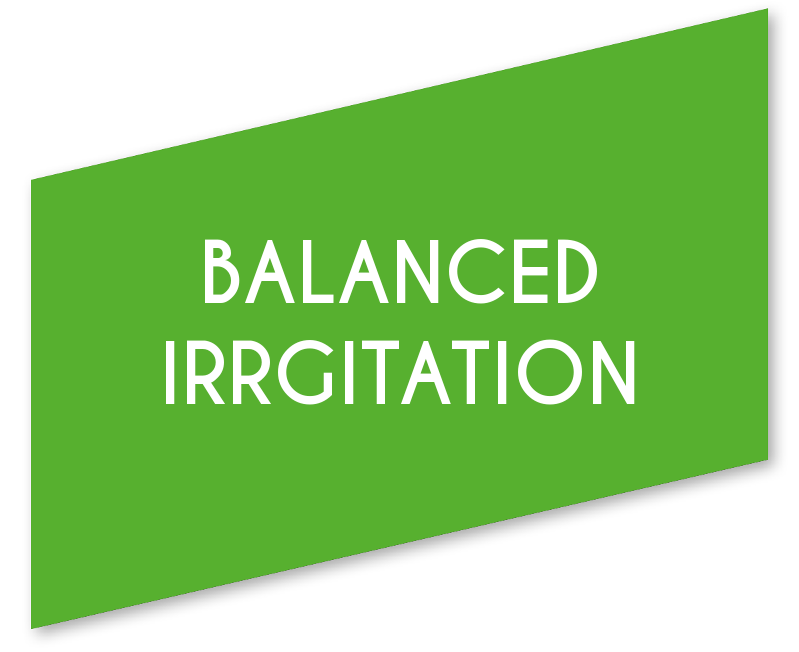 It releases slowly and gradually the nutrients, all nutrients are included for the life of your plants. Our soil contains microorganisms like helpful bacteria and small mycorrhizae. This way our soil follows the growing cycles found in Nature. 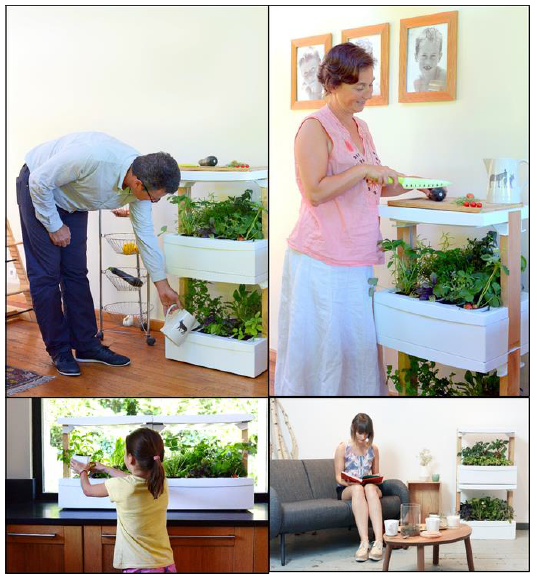 Your produce grows at home, you have a full control over its growth. It requires 0 pesticides and you harvest it when fully ripe. 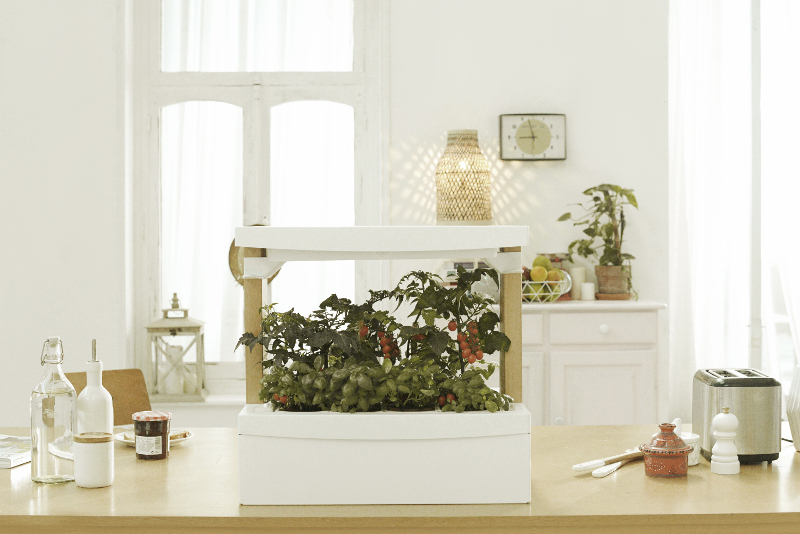 Fresh Square’s light fosters the plants growth, even in the darkest rooms. Wicks in the water reservoir connect to each refill and deliver the right amount of water to the plants keeping the soil moisturized for 3 weeks. 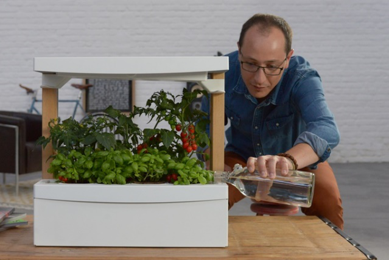 This smart system saves 80% of water consumption compared to watering an outdoor garden! Fresh Square reproduces Nature, and our App is here to reconnect you to Nature as well.Make it a complete experience. 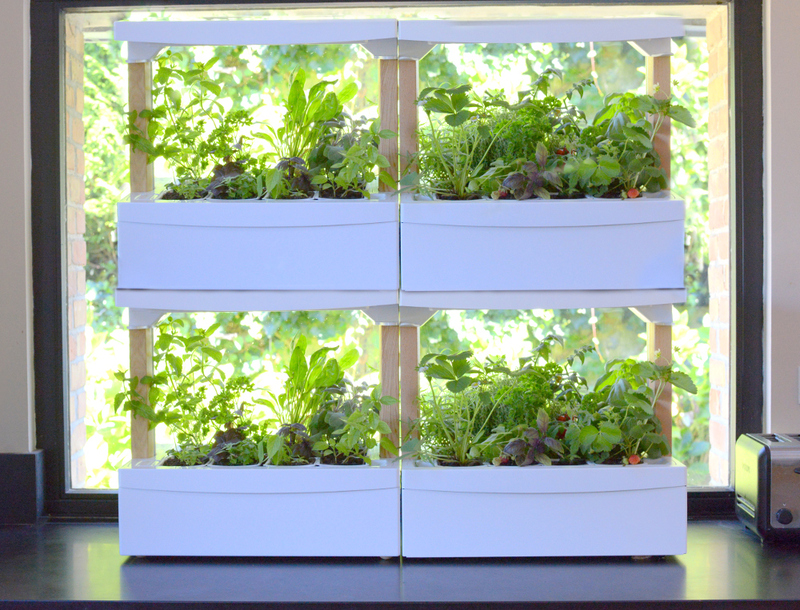 You can stack your Fresh Squares together and create a vertical garden with up to 4 Fresh Squares or even combine them side by side to create a horizontal garden. Not having the answers to your questions? What if I changed address after ordering? Don’t worry, we will ask you your updated address just before shipping. We will also send regular updates on the project, and you can always send us an e-mail. When will my Fresh Square be shipped to me? We ask for 8 months for Europe and 10 months for North America (USA and Canada). It is the reasonable time for us to proceed with manufacturing and shipping. Why is Fresh Square not available in my country? We are as sad as you are to not be able to deliver Fresh Square to your country. But we would rather be careful and go step-by-step as our product requires shipping soil and microorganisms. The more people request Fresh Square in your country, the faster we will make it available there. Can I get more than one Fresh Square? Every person can choose only one rewards. To get more than one Fresh Square, select one reward level, and then add €210 (or £178 or $235) to the amount. This way, you will automatically get the discount of 40% for every Fresh Square you add. 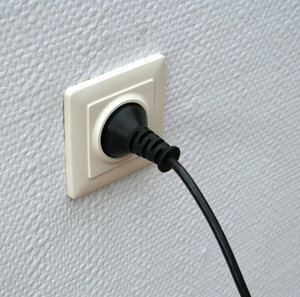 You can add up to 4 Fresh Square on top of each other, using only one plug. You can also add them side by side and make yourself a wall separation for instance. How about the insects? Does Fresh Square prevent them from staying in it? Fresh Square has no action against bacteria and insects. The refills only have beneficial microorganisms, however insects could come from the outside, etc. What is the Fresh Square’s material? 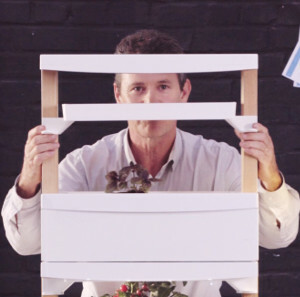 Fresh Square is a high-end product in recycled aluminium, recycled steel and sustainable wood. 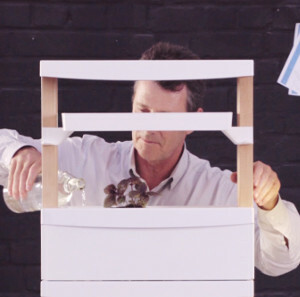 Only the lamp and the parts in contact with water are in plastic. It is recyclable, so please make sure to recycle it. How frequently should I clean Fresh Square? It won’t be necessary more than once a year. When you do want to clean it, it is really easy. How heavy is Fresh Square? What is the size of the Fresh Square? Can you give me a reference? Fresh Square size is 51*36 and 50cm high. It’s slightly bigger than a microwave. What is the standard voltage for Power Supply? Can Fresh Square light run 24/7? If you want to have it on at night, you can switch it back on by pressing the button on the lamp. If you want to switch it off during the day, you can also press the same button on the lamp. 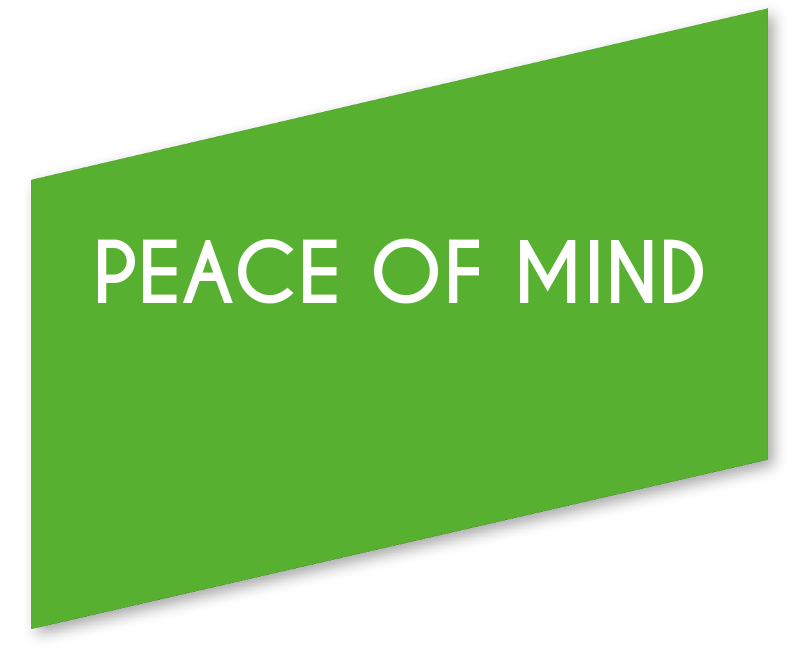 Fresh Square comes with a one year warranty against manufacturing defects. Are Fresh Square products organic? 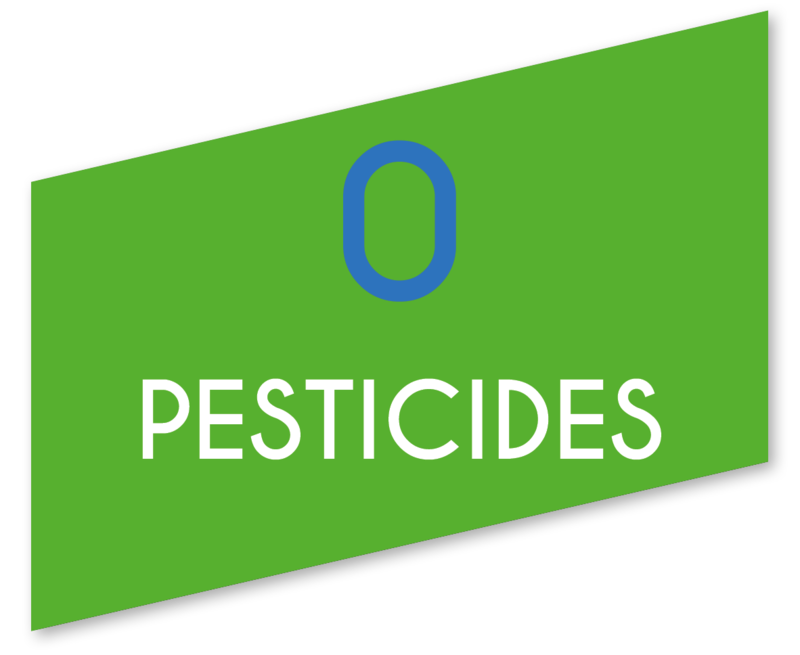 “Organic” is a tricky word and highly depends on regulation. In the US, Fresh Square would be labelled organic. 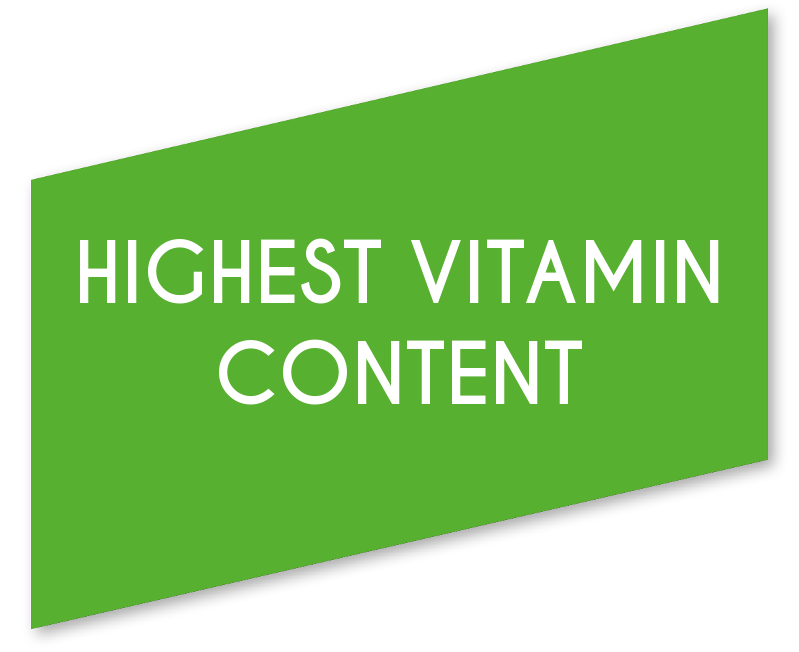 In Europe, produces are organic only if they are grown in the earth. With Fresh Square, you are growing it in your living room, meaning that your Fresh Square produces are all natural but not considered by the law as organic. However, at Fresh Square we set high level standards to make sure the food grows with standards similar to organic food. 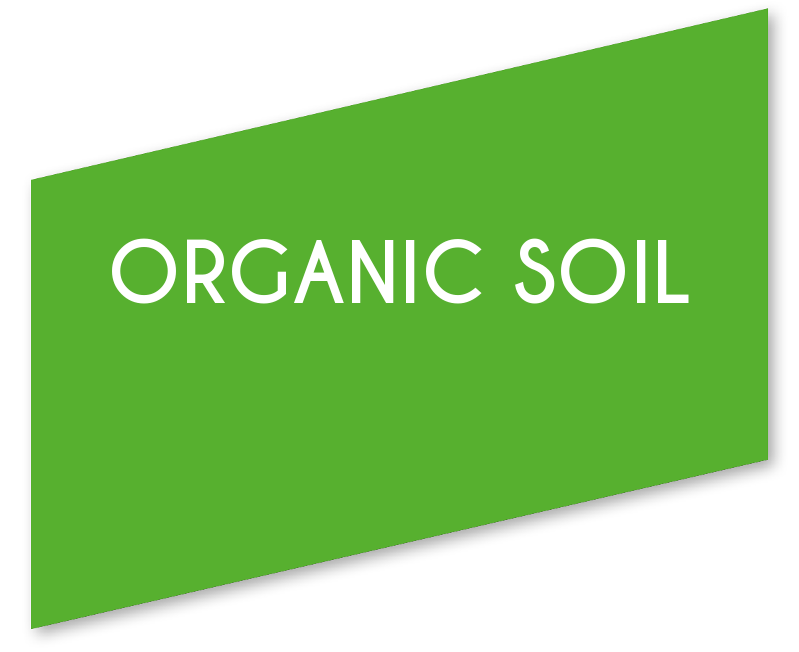 Indeed our soil is compliant with organic potting soil regulations and we put emphasis on mimicking the process of nature. How do I set up Fresh Square ? Can the soil be re-used? If you can avoid it, don’t throw your soil away. Even though the soil cannot be reused twice inside the Fresh Square, it is still useful and has lots of nice microorganisms in it. You can use it as a base for another plant pot, or you can scatter it in your garden or in a park. Soil should never end up in the trash since it’s a part of the earth. How many seeds are there in one refill? It depends of the variety. We made sure there is enough of them to ensure you can grow your own food jungle . How much will refills cost? Refills will cost from, 2€ up to 5€ depending on the rarity of the seeds. For example, if you choose standard basil, you’ll be able to enjoy 6 months of fresh basil for the small price of 2€, which is more cost-effective than organic supermarkets. What is the shelf life of the refills? You can buy a refill and keep it at home for up to 3 months. After that, our microorganisms within the refills won’t be as efficient. 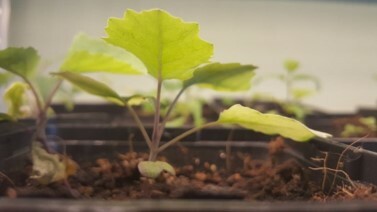 Can I use my own seeds, my own soil, transplant plants? How can I do this? Yes, you can buy one of our “experimental refills” with our standard composition and no seeds. You can also try to mix your own potting soil into the Fresh Square. Just note that gardening store potting soil is poor in nutrient, and you’ll need to add fertilizer for plant growth. 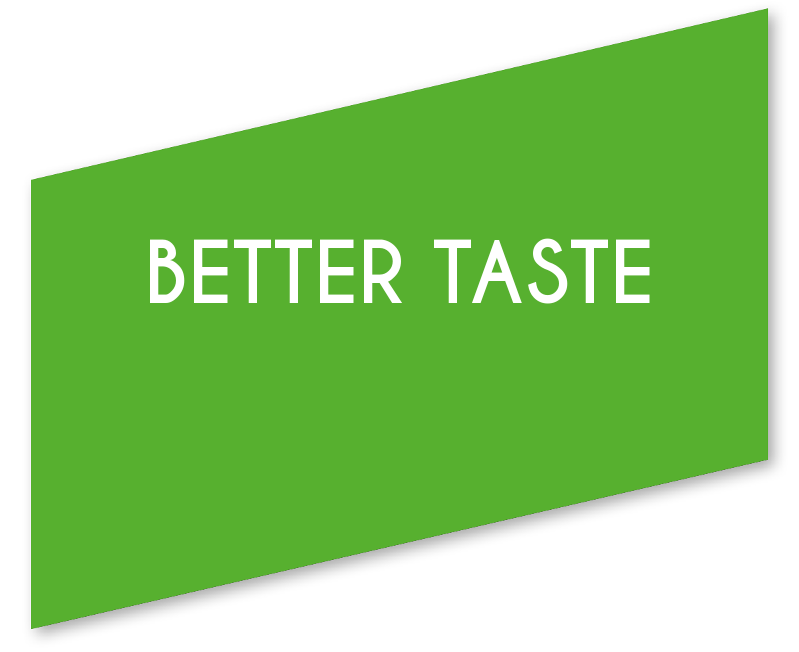 Fresh Square App will give you tips to help you throughout this process. Many Fresh Square plants can be placed into your garden after their growth. 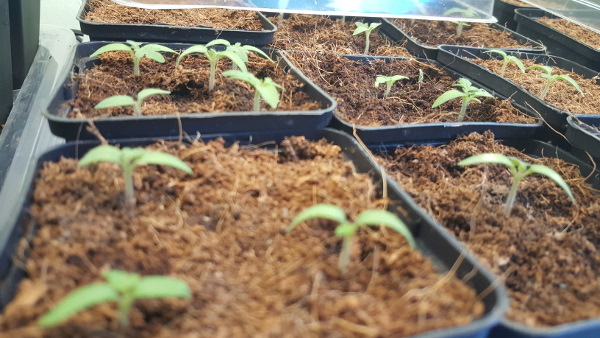 You can also use Fresh Square as a seed propagator, to start your own seeds before planting them in a veggie garden. 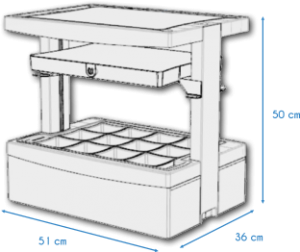 We are happy to empower outdoor gardeners to grow their baby plants in the safety of Fresh Square. How do I optimize the amount of harvest to gain self-sufficiency? The idea is to make a rotation between your refills in your Fresh Squares. Everything will be explained in the app. 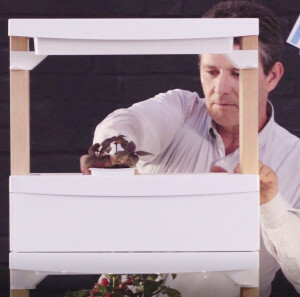 What’s the appropriate temperature for growing, what if the heater in winter is too strong? Fresh Square doesn’t require any former gardening skills. But plants are still living things that deserve a bit of care. 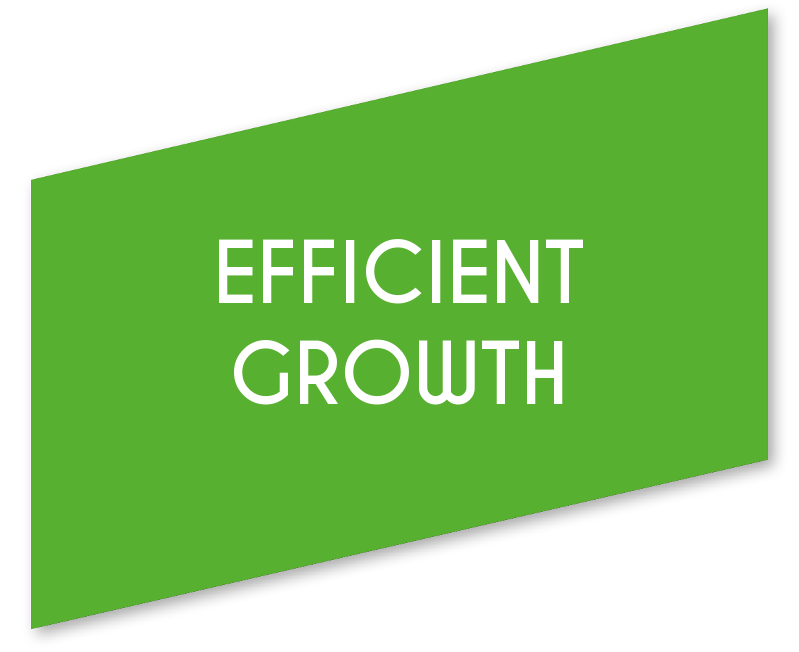 So the best temperature for your plants to grow at is around 20-25°C. Humidity is a plus. Just make sure that your Fresh Square isn’t too close to your heater or you’ll risk drying the plants, or evaporation from the water tanks. When you go on holiday, make sure the plants have plenty of water. If the outside temperature is really cold, expect the plants to also grow slower in your colder home. Under 10°, the plants could die. You can also decide to finish your current refill and to start a new one when you come back. Is the lighting LED UV? or Infra-Red? Neither. Guess what? Plants actually don’t need much UV. They already get plenty with what is within our homes. 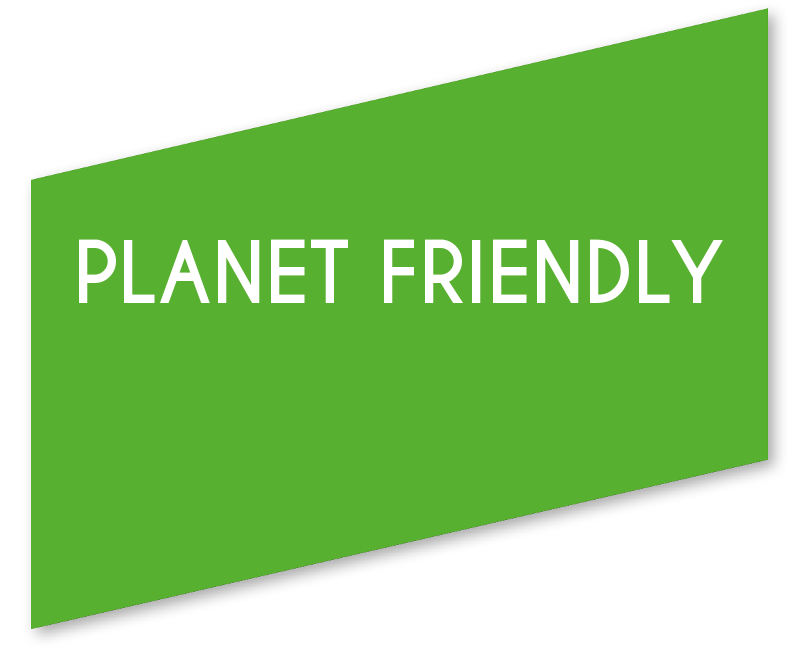 Our LEDs have a specific plant-friendly spectrum within the visible range. No UV, or IR required. Do I have to constantly monitor the plants? Just make sure you take a look at the float every 3 weeks. If you are ever worried about your plants status, just add a bit of water to the tank and let Fresh Square control the amount of water the plants receive.